Hospital-grade surface disinfectant (a pandemic and infection control product.) Ready-to-use, multi-purpose broad spectrum disinfectant/deodorizer for hard and soft surfaces. 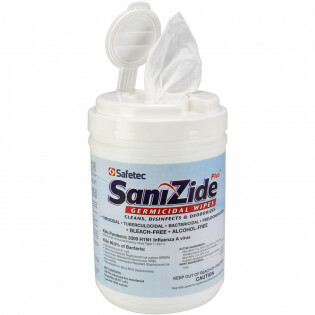 Personal Germicidal Wipes individually wrapped and in dispenser canisters - SaniZide Plus Germicidal Wipes - These pre-saturated, hard surface wipes kill TB, MRSA, VRE, E Coli and more in 10 minutes and HIV-1 in 2 minutes. This latest formulation is non-corrosive and fragrance free. Our pre-saturated surface wipes leave virtually no lint or particles to scratch or contaminate surfaces. 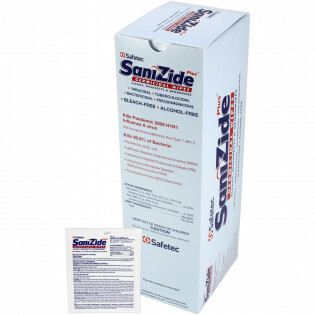 All SaniZide Pro® products are ready to use, convenient and user-friendly.